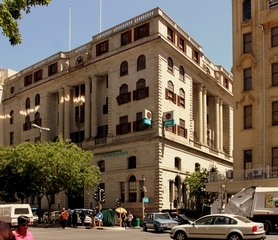 The First National Bank building, in Adderley Street, designed by Herbert Baker. Sir Herbert Baker was at the height of his career when he designed what was then Barclays Bank. His reaction to the commission was not one of enthusiasm, for he remarked, ‘I really do not feel that I much want to do the work except for a rather natural longing to attempt to remove some of the squalor of Adderley Street.’ It was designed in Baker’s London office, but carried out by by the Cape Town architects, Forsyth & Parker. This was the last building that Baker designed in South Africa. It shows the approach of the mature architect, with the bold and dignified facade of grey granite and the domed banking hall within the great bronze doors. The sandstone that was used for the walls, were taken from a specially opened quarry near Ceres. The travertine and marble used for the walls and floors of the banking hall were specially imported from Italy. The furniture and fittins were also designed in London, but made in Cape Town. During the 1920’s the roof was heightened, but it retained the central dome with the figure of Britannia on top.